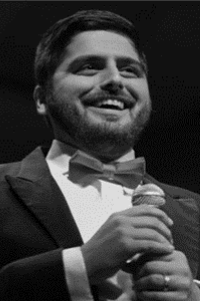 Dominick Izzo, an upstate New York native, received a Masters in Choral Conducting, and a Bachelors in Music Education from George Mason University. Before coming to Osbourn Park, Dominick was able to sing and play with many professional institutions such as the National Symphony Orchestra, the Nation Philharmonic Chorale and Orchestra, Seraphic Fire, the Brethren, and many others. Dominick has also traveled the country conducting choirs of all levels and sizes. He has participated in conducting master classes for renowned conductors like Dr. Craig Jessop of the Mormon Tabernacle Choir, and Patrick Dupréy Quigley of Seraphic Fire. Dominick continues to accompany and sing professionally in the D.C. area. Currently, Dominick serves as the Director of Choral Music and the performing arts department chair at Osbourn Park High School. Under his direction, the choirs at the school have been able to sing at the Hylton Center for the Performing Arts, sing back up for the band Foreigner at Jiffy Lube Live, perform in Cathedrals and Concert Halls near and far, and receive superior ratings at state assessments. Dominick also serves as the Director of Music at St. Thomas United Methodist Church in Manassas. There he directs the chancel choir, the hand bell choir, and the Joyful Noise Singers. Dominick resides in Bristow, Virginia with his wife, cat, two dogs, and daughter, Chloe Mae.